Sioux Falls Baby Dollz (SFBD) is an organization whose mission is to empower, build self-confidence and develop athleticism in children ages 7-17 in a positive team culture. SFBD teaches safety, skating and the sport of roller derby with an emphasis on character development. We have 2 teams within our league. The Baby Dollz is the team that represents us as a “B” team. Our “A” team is comprised of our best skaters and compete as Sodak Attack. 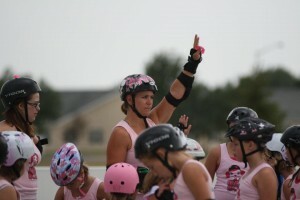 Empowering women is a big part of the Sioux Falls Roller Dollz mission. It will be very rewarding to pass this down a generation and teach the values of perseverance, hard work, team work, boundaries and respect–values applicable to derby and everyday life.” The 2012 summer camp covered basic skating and safety skills, off-skates fitness, beginner strategies of roller derby, and lessons that related to derby and life. The summer camp became much more than just a camp! Therefore, it was no surprise when parents and girls insisted we need to keep this going! This camp was the beginning of what is now called The Sioux Falls Baby Dollz.